3 Beds | 2 Baths | 2,094 Sqft Disagree? 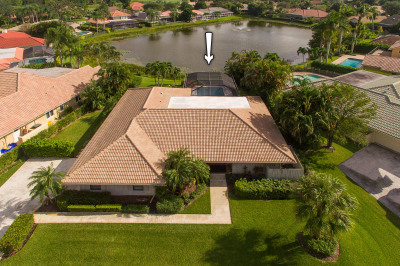 Long lake views surround this fully updated, 1 story, 3BR/2BA estate style home with a desirable south east exposure, located on a large lot in the highly sought-after community of Thurston in PGA National. This bright & spacious home is perfect for entertaining and has many desirable features such as vaulted ceilings, tiled flooring, large windows & sliding glass doors, a completely updated gourmet kitchen with white cabinets, gas stove, and stainless steel appliances, and a spacious master suite with His & Hers California closets and a luxuriously remodeled bath. The expansive patio is screened-in and has a covered sitting and grilling area overlooking the large swimming pool and lake.